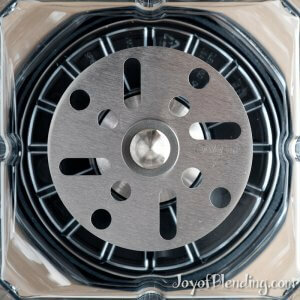 Here’s my review of the Vitamix Aer Disc Container. Instead of blades, it uses a disc with holes in it, which makes it less aggressive. They named it Aer for aeration, referring to its ability to whip up foams. It can also extract flavor from ingredients for drinks, and emulsify sauces and dressings. It works on all full size (non S-Series) models, so that includes everything from the classic 5000 up to the latest Ascent models. As usual, if you order via my link, you get free shipping, and Joy of Blending gets a commission. Vitamix does not intend for users to remove the disc from the container, so you shouldn’t plan on swapping it into an existing container. Culinary emulsification is combining oil and water-based ingredients in a mixture of microdroplets for a dressing or spread (e.g. vinaigrette or mayonnaise). As with whipping, the standard wet blade containers can do this. I’ve made plenty of well-emulsified vinaigrettes in a wet blade container. I’ve never really liked mayonnaise, but for this review I tested making it. I used Vitamix’s vegan recipe, and it came together perfectly with the standard wet blade. Because it doesn’t have blades, the disc is more gentle, so for tricky emulsions it may help a bit, but I think in most cases the standard containers work well enough. 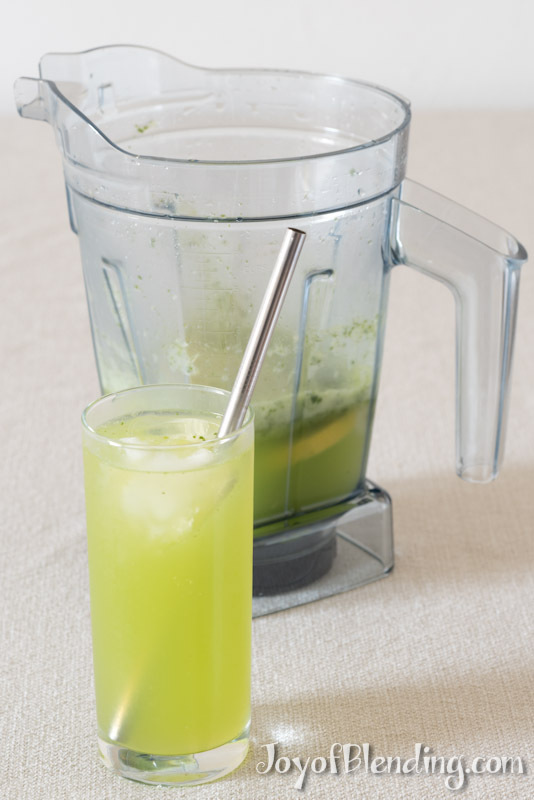 I tested making a mint lemonade, and I found that to fully extract the lemon, the mint gets over-muddled. 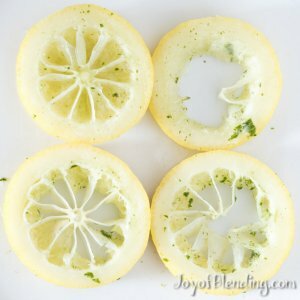 So if I were doing it again, I would add the mint later in blending, and lower the speed to medium after the lemon is extracted. The other trick is that you can add ice, and the disc will not pulverize it. So you can cool a cocktail or lemonade and leave ice cubes intact, in the same way that you would use a cocktail shaker. You can strain out the solids by unlatching the lid and then holding it in place as you pour. This works surprisingly well to keep ice, seeds, skins, etc. in the container. This task is quite similar to whipping, in that it involves incorporating tiny air bubbles into a liquid. 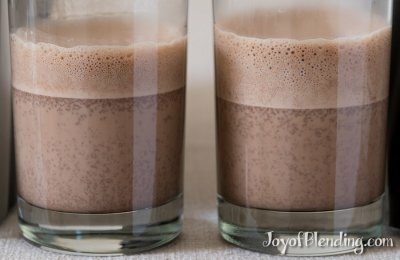 Vitamix mainly highlights making milk foams for coffee drinks. They say that it only works with skim milk, but I actually had good results with whole milk. Skim milk foams are more stable though. Starbucks uses the Vitamix Aer disc to make their cold milk foams. The thing is, in most cases for home coffee drinks, a small milk frother like this one is sufficient. The small frother is more convenient and much cheaper, though the Aer disk can make more robust foams. I was excited to try making aquafaba foam. (Aquafaba is the liquid left behind after straining out cooked or canned beans, typically chickpeas. It is possible to beat air into it similar to what you can do with egg whites, and you can use it to make meringues and other vegan desserts. Many people agree that the bean flavor does not carry over, and the transformation from bean water to a voluminous foam is kind of magical.) People usually use an electric mixer or stand mixer. In the past I tried using a standard Vitamix container, and it was able to whip up a foam, but I was not able to get stiff peaks for meringues. I tried a variety of techniques (different speeds, with and without tamping, using powdered sugar, using cream of tartar). After the third failure to form stiff peaks, I transferred the aquafaba mixture to a bowl and used an electric mixer. Within a few minutes I had stiff peaks, so I confirmed that there wasn’t a problem with the aquafaba. Vitamix lists an aquafaba “fluff” in the Aer disc recipes, and the recipe notes make it sound like they also were not able to get stiff peaks from aquafaba. The standard wet blade Vitamix containers can whip, emulsify, and foam to an extent that is usually perfectly satisfactory. With some ingredients, the Aer disc works a bit better, but on the whole it’s not a huge difference. If you only have a wide container (64-oz low profile), then the Aer disc will allow you to do these tasks with smaller amounts, but a 32-oz or 48-oz container would also work, while allowing you to make smaller amounts of more common blends like smoothies. On the other hand, muddling is a technique unique to the Aer disc. It does a surprisingly good job of extracting the fruit from citrus, and the lid makes it easy to strain out the solids. If you’ll be blending up a lot of cocktails or lemonade, the Aer disc could be a nice addition to your arsenal. 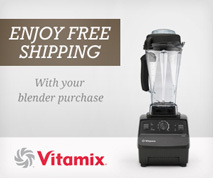 If you are at all tempted, note that it is covered by Vitamix’s 30-day trial period, so you can return it within 30 days for a full refund if you don’t find it worthwhile. To make a foam, you need a minimum of 1/2 cup of liquid, because you need enough to cover the disc. To do the citrus extraction trick, you need at least 1.5 cups of liquid to get the flow going. I tried with 1 cup, and the lemon slices just got stuck. Very nice review and thanks so much for introducing me to aquafaba–I’d never heard of it. Outstanding review, so thorough. You even made me feel better about purchasing a 7500 instead of Ascent series. I think that what with the speed differences as well as unreliable Wi-Fi I’d have been incredibly unhappy. So, there’s a year’s worth of fretting over and done. Your comparisons and test are so incredibly helpful. I’m glad you liked my review. The 7500 is a great machine, but I want to clarify for other people who may see this comment: the Ascent speed response is different, but it’s not inferior. It still gives control over the full range of intermediate speeds. It just increases more slowly at the low end of the dial, and faster at the high end. And aside from hearing about a few lemons that Vitamix replaced, I haven’t seen any reason to believe the Ascent’s wireless connectivity is unreliable. WiFi is only needed to download the app. Once the app is downloaded you connect using Bluetooth so no internet connect needed to operate the Ascent or Venturist models. I have the Vitamix Venturist 1200, it’s an awesome machine. Excellent and objective review. I was tempted by Aer container launch marketing, but your tests and comments make me feel great about owning a 32oz and 64oz standard, wide, wet blade containers. Thanks for all your research! I’ll keep reading. Agreed and it’s unfortunate that Vitamix seems to have phased out 32-oz. containers for those seeking anything Ascent-compliableK. I think you are right about the need to lower the recommended speed for non-Ascent models. I have been trying to create foam for two weeks on my 6500 and was getting frustrated. After reading your review more closely, and watching your video, I dialed the speed down to a 3. I was able to make perfect whole milk foam for a flat white. So thank you for that suggestion. This was what I needed to hear!!!!! Thank you! My milk foam was a flop, but I think I was doing it at too high of a speed. I have a G series. Great review, thank you. I did buy the Aer but will send it back. My regular blade does the job just as well for dressings and smoothies — the main uses. Foam did not work well with using two types of milk, and we have a smaller unit to do that anyway. I’d really like a much smaller container instead of the larger ones as well. Still love my Vitamix! Can you clarify for me, on the Vitamix ascent 3500 can I use the 8oz and or 20oz detect bowl and cup to make peanut butter and nut butter? If you use oily nuts or add oil, it will work in the 8-oz container (and probably not in the 20-oz container). I haven’t done the testing to say which nuts are oily enough to blend in there without added oil. And how much oil comes out of nuts can vary from batch to batch anyway. For a sure-fire nut butter, the 48-oz container is better because you can use the tamper (or the stock 64-oz container if you’re making a big batch). Awesome review. Ordered using your shipping code. With a 30 day no questions asked refund policy we decided it’s a no brainer to give it a try. will this make whip cream? If so can you use coconut milk please? It makes whipped cream easily from whipping cream. I don’t think it would make whipped cream from coconut milk. It might work with coconut cream, but I haven’t tried. I have tried twice to whip coconut cream. The first time my cream wasn’t cold, so it didn’t whip. The second time my cream was cold. I used a 5oz can and I don’t think there was enough liquid in the container for it to whip. So, my last attempt will be to try a larger can of cold coconut cream. My understanding (based on reading, not my own testing) is that there is a wide range of coconut cream, and some whip much better than others. I have drained down the sink close to 4 gallons of whole milk in the past 13 days trying to make the perfect foam and the thick whipped cream you see in QVC and here on this website. I have Ascent 3500,and 780G. Tried everything from keeping the pitcher in the freezer to super cooking the milk. Nada, no go. Get frothy layers that my hand frother does much better. What do you think I should do or do you think I got a lemon? In my experience, the main thing is to get the speed right. Too fast and the foam can collapse, too slow and it doesn’t really form. I have heard that other people haven’t gotten whole milk to form a foam in the Aer container. The two things that will definitely work are skim milk and whipping cream. I can’t think of how you could have a lemon (assuming the disk spins and the container doesn’t leak). The reason I think it is a lemon because my strawberry got completely emulsified.. And according to all demos that I have seen so far, that not how is should be. Also the video above was able to achieve a perfectly nice cream from while milk, whereas I have been struggling to get anything but froth. Thanks so much for this post — especially on aquafaba. I’m trying to find a non dairy, non nut coffee creamer substitute, and I stumbled onto aquafaba online somehow. I tried it in my Vitamix; don’t own a stand mixer — which all instructions say to use a standing mixer. IT works OK, but not too stiff peaks. I ordered a standing mixer from Amazon JUST to make aquafaba whipped cream and then I saw this post. I’m so glad you have stifled my fears that I did the right thing. Can’t wait to try my mixer and not going to buy AER DISC. I wish you’d posted before purchasing. Did you look into the Bosch Compact? Very reasonably priced and a real powerhouse in a tiny size. If you want to add bread-baking to your repertoire as well, it would’ve been a great choice (far superior, in fact, to a KitchenAid). I’ve made boiled flour frosting, which requires a good 15 minutes of beating at highest speed to come together, in my Compact; it never broke a sweat. The only reason I upgraded (to an Ankarsrum) is because I finally could, not because I needed to. You could also try Oatley, a fairly new product made by a Swiss company. It is Oat milk, and was initially sold into coffee shops as a non-dairy, non-nut milk for making lattes, etc.